Our family story to rebuild, restore, and refurbish a Lazy Days houseboat project. We were CRAZY to buy this old steel hull, 1966, 45 ft. Lazy Days houseboat, but the price was right $3500. After the first month we decided to learn about it on a forum. We found out it needed to be pulled out of the water and checked out so we hauled it to my sons back yard. Now 3 years later, and about $35,000 dollars later, we have finally emerged with a wonderful "Lake Retreat". We ended up needing an all new steel for the hull for the houseboat, and we actually tore everything out of the boat until all we had left were sidewalls, an engine, and a wheel. My husband and I had remodeled several houses, but the labor and time never equalled what we put into this houseboat. He had to learn all about marine wiring, plumbing etc. And my son learned how to panel and lay flooring and cut steel, and I had the fun of painting, insulating, designing, and decorating the interior. Salvaging this 40 year old boat was a labor of love that brought us even closer to our son, I know it taught him to never give up even when others say it can't be done. 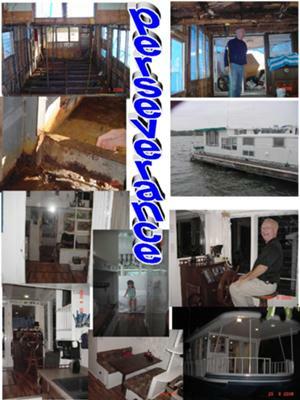 Above are some pictures of our new/old boat which we rightfully named PERSEVERANCE. Nancy, welcome to the houseboat forums, and a BIG CONGRATULATIONS for the "perseverance and all the effort to remodel, refurbish the classic Lazy Days. My wife and I know that there is lots of sweat and love that goes into such a big project, but your family can now be proud of what you have all accomplished. There is an article on our site for beginner or newbie houseboat buyers to think about before buying older houseboats. It has time and money saving tips for new prospective houseboat buyers. Lastly, hopefully some of our readers will share and post comments about their Lazy Days houseboat experiences. Feel free to use the "Click here to post comments." link found near the bottom of this page. Comments for Lazy Days Houseboat - a refurbish remodel restore project for the family. We have a 58ft. 1976 Lazy Days Houseboat. We are completely new to this, and I have made alot of mistakes already, starting with a lack of an inspection. We have decided to gut it comepletely. Question is, does anyone know if there are load bearing walls? Also, where can I find some better designs of proper space usage? Ours has only 1 bedroom and 1 large bath with a Jacuzzi tub. I would prefer a wetroom and a guest room as well as an office...I see smaller boats with alot more sleeping quuarters and pantry space than what we have. Lastly, We would like an easily removeable or foldable shade on top of the boat. Any ideas for us? I'm getting reading to purchase a !966 Lazy days 43 ft houseboat.. I would love to see more pics and any info you have on yours. I just have an issue with the shower/tub combo, drain pipe breaking and I took on over 15k in saltwater, because the guy that sold me the boat, put flooring over the access plates. So can anyone assist with that. In regard to the question about where does the shower drain, mine was below the waterline with a calm shell cover over it. The keyword "WAS", as it is now dumped above the waterline. Just like the kitchen sink it should drain right into the lake. There should be a drain out the side of the boat. Have you turned on the shower and walked around to see water running out the side and into the lake? Where does the shower drain to? We bought a 50 foot Lazy Days houseboat, and we can't find where the shower drains to? Do you have any ideas? The hull numbers on a Lazy Days houseboat are on the rear, outside hull. They are stamped in the metal about 6" from the transom, usually on the rounded corner. If they have been painted over, you will probably have to remove the paint (CAREFULLY!) in order to read them. The numbers are on both sides. It's on the starboard side 10" above the outdrive, under swim platform. I bought my 1988 Lazy Days 3-1/2 years ago and I LOVE this boat. I am a single woman, and working on this boat has been so easy. She drives so easy. The name is Liquor Box. The only problem I have is finding the Hull Identification Number. Looked everywhere! Does anybody know where it is? I am enjoying reading all the comments about houseboats and especially the Lazy Days. I have been looking at houseboats for over six years, and to me they all seemed to look alike, nothing really unique among the major houseboat builders, until I was in Buford GA and got introduced to my 1st Lazy Days. That was in Aug 2010, right before I was to report for my 4th military deployment, so I had to put a hold on houseboat hunting, but I still looked on the web. Last week, I found what I had been looking for, a beautiful 1989 Lazy Days that had been totally updated from the bottom up, it was love at 1st sight! I close on her next week and plan to spend the New Year on her to celebrate my 1st year as a breast cancer survivor. What we did was use 2 Raritian toliets the most expensive ones they make and also installed new plumbing lines and holding tanks. Expensive, but it has been well worth the money as the last thing you want to happen is to have a boat full of people and toilets not working or a holding tank too small. Folks I'm in the middle of redoing a 1963 Lazy Days (my pictures of how it is currently down to the studs look much like the ones above) and could use some help from those of you that have "been there done that". I've spent a lot of time working on the elctric system (very proud of the 7K watt inverter powering a normal household 110v system and waiting for the solar panels on top...but I digress). I just realized for the first time that the shower and toilet were original as direct discharge (a big no-no of course) and both go out below the waterline. I'd love some suggestions and pictures of what you've done for bathroom configuration as well as how you solved the shower (how to get water to go out and not slosh back in since it's below waterline) and toilet discharge problem. I've got some thoughts but would love to see some that have actually been done. Any help appreciated. My husband and I are doing a refurbish on a 1989 Lazy Days wide-body houseboat. He is the most wonderful man that has put my wants above his. The boat has been gutted to the studs, new plumbing tanks, lines, electrical, granite floors, granite tops, maple cabinets, top of the line appliances, new sliding doors, new skins on the outside, new windows, new gelcoat, and new outdrives. The most amazing part my husband has never spent one night on a houseboat. I have and still have the friends I met on the docks. She should be done in the next couple of months,he has dedicated countless hours for this family to enjoy out time on the lake. It sounds like you've got yourself a wonderful husband, and do enjoy the new houseboat. My son just bought a 86 Holiday Mansion houseboat that was the victim of an 81 year old live aboard (duck tape was her chief form of maintenance) and then IKE came along. So far we have gutted the galley, and living area. Well, I get busy watching the pelicans, sea gulls and we even have a dolphin that visits once in a while. I think I'm going to get fired before this is all over! I have some job security though, I'm making all the curtains. Delighted to hear others make a family project out of this refurbishing. Many thanks for bringing the old Lazy back to life. My family has owned ten houseboats, the last three Lazy Days. All things considered, they are probably one of the best built houseboats ever. I currently own the "Last Lazy", #519, a 18 x 87 foot deep V Hargrave design. Wouldn't trade it for anything!